If you are serious about getting every ounce of nutrition from your food, Greenstar juicers have probably come up on your radar. These juicers are the ultimate in power and performance, and give you a power-packed nutrient boost every time you use it. 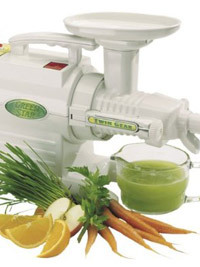 Greenstar juicers are twin gear juicers. Twin gear juicers, also known as triturating juicers, are the most efficient type of juicers. 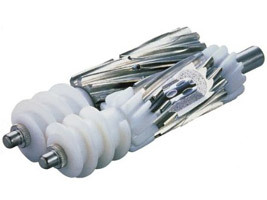 This is because they use two interlocking gears to grind raw fruits and veggies and extract their juices. These gears ensure that more juice is extracted, so you have far less waste than you do with some other juicers. Like masticating juicers, they press the pulp to strain the juice, they just grind finer, and can extract more juice. One of the greatest benefits of twin gear juicers is that they are able to handle pretty much any raw food you throw down the feeding chute! Unlike most centrifugal and masticating juicers, all twin gear juicers (including the Greenstar) can handle leafy greens, sprouts and wheatgrass. You can use them to make a wide variety of other foods as well, such as baby food, sorbet and more. They will easily grind up nuts for nut butters, so you can make your own fresh almond, cashew or even peanut butter right at home. Greenstar juicers also handle grains, so you can grind wheat and other whole grains for your own healthy breads and pastas. The Lower the RPM the Better! An important thing you should know about juicers is the higher the speed, the more foam you get in the juice…and that leads to faster oxidation. Oxidation, in turn, leads to the destruction of beneficial enzymes. Greenstar and other twin gear juicers, on the other hand, operate with a lower RPM and have minimal noise, friction and heat generation. This means that you get juice that has more of its fragile vital nutrients and enzymes intact. Greenstar juicers are perfect for those of you who already love juicing, and have made it a part of your overall healthy lifestyle. You can make your own wholesome beverages, butters, flours and so much more. You can also feel secure knowing that you’re feeding your family nutrient-packed, natural ingredients at every meal.